All of IBERMEDIA's electronic screens are LED NICCHIA which guarantees the highest quality parameters expressed in a well defined image, colour realism and image uniformity throughout the entire area of the Screen. 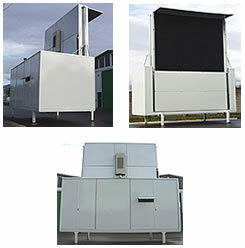 These screens are also equipped with automatic fine-tuning of brightness and colour balance (AACC - Advanced Automatic Colour Calibration), adapted to ambient luminosity (sunlight) so as to obtain perfect visibility during the day, even under intense sunlight. The Brightness of each primary colour (RGB) is controlled independently in order to obtain the best results in terms of realism and image quality. IBERMEDIA’s mobile Electronic Screen units are integrated multimedia systems, which are totally autonomous, even with respect to power supply requirements since they possess electrical energy generators. These systems are prepared to deal with any type of digital format (CD, DVD, MP3, Video Cam, etc.) and are equipped with an audio section with 2,400 watt power. They can also receive TV and Satellite broadcasts and have access to the Internet. In terms of operationalization, once the vehicle is parked on site, these units only require approximately 15 minutes to be put into operation and the vehicle (tractor) can be removed from the site, leaving only the Screen support structure and the system control room. 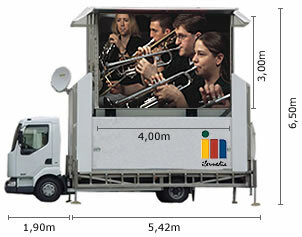 See video demo of Ibermedia Electronic Screen mobile units.